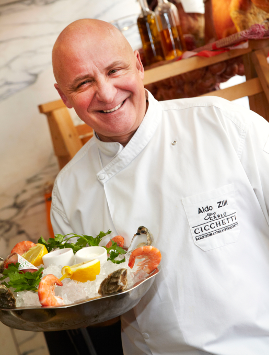 This month Your Healthy Living is launching an exciting new cookery competition, and we are delighted to have celebrity chef and restaurateur Aldo Zilli on board as one of our judges! Famed for his Italian, vegetarian and seafood cuisine, the 59-year-old Italian-born chef was the founder and chef-patron of some of London’s most exciting and innovative restaurants including Signor Zilli, Zilli Fish and Zilli Green. He helped to launch the upmarket Italian restaurant San Carlo Cicchetti in London's Piccadilly and Covent Garden and is now executive consultant for the San Carlo restaurant group, with 17 restaurants in the UK and four abroad. Aldo has written 10 books, including two autobiographies and various cookbooks, and he appears regularly on TV both as a chef and a presenter. He gained a huge following on ITV’s Celebrity Fit Club where he achieved a new slender figure and a passion for health and fitness which he maintains today. Q: Are you looking forward to judging our cookery competition? Aldo: Absolutely. It’s a great thing to do and I’m looking forward to seeing what the readers come up with. It’s nice to see new talent coming through. It’s a great way to encourage healthy eating and cooking. Q: You have developed a passion for healthy eating and fitness since winning Celebrity Fit Club a few years ago. What prompted you to take part in the show? Aldo: Well, at the time I was three stone overweight and I had a very disorganised lifestyle. I decided it was time to change my diet and my life in general because I wanted to lose the weight and stay healthy. It was an immense change because I stopped drinking alcohol, I stopped eating carbs for three months and I cut down on sugar. Not having sugar in my coffee was a big thing for me. All those changes made such a difference. And then I lost three stone in three months. It didn’t happen overnight of course – it took a lot of hard work! It was the best decision I made. Q: That’s an amazing achievement, losing three stone. How did you feel? Aldo: I felt on top of the world to be honest – fitter, lighter, more energetic. Before, I used to have very disruptive sleep, but after I lost the weight I had a great sleep every night. It was all thanks to changing my diet and taking up exercise. For me it’s 20 per cent exercise and 80 per cent diet. Q: Would you say you are much more health conscious these days? Aldo: Absolutely. I went on holiday recently and I went running every day before breakfast and had lots of fish and vegetables at night. I only had carbs a few times during the week. I managed to go on holiday to Italy and lost weight, which is unheard of! I allowed myself a few gelatos though. Q: Do you find it hard to stick to a healthy diet when you work with food all day long? Aldo: Yes, but it’s all about moderation, controlling your portion size and eating little and often. I don’t eat big bowls of pasta any more. I will have it as a starter rather than a big main dish and the sauces I make are much lighter. Aldo: I have a very good breakfast. I might have porridge with berries or I might have some boiled eggs – it varies. When lunchtime comes it’s quite early and I’ll have a plate of vegetables and a couple of ravioli. For dinner I will have chicken, steak or fish – grilled, poached or baked instead of fried – and whatever vegetables I can find. Aldo: It’s mostly cardio. I go running or I go to the gym and do some cardio work. If I don’t have time to do a morning run I always make sure to fit it into the afternoon. Aldo: Not really, but I do a lot of juicing. In the mornings I have a mixture of carrot, ginger and kiwi fruit, and sometimes I add some spinach too. I rely on my diet to get all the nutrients I need. Q: Can you give our readers any tips for how to cook in a healthier way? Aldo: I always recommend poaching, grilling and baking rather than frying. Keep an eye on the ingredients you are adding to your food. Keep it simple. Eat a clean diet and keep a clean environment in your kitchen. That’s what works for me. Aldo: I like to roast some really good sea bass or a nice organic free range chicken with just some lemon and thyme. It’s about keeping it simple again. Let the ingredients do the talking. Q: You are an ambassador for several charities such as Bowel Cancer UK and Heart UK. Is it important to you to help educate the public on healthy eating? Aldo: Yes, because I have a very big history of heart disease in my family. I lost my parents and three brothers to it. That’s why I am so adamant about educating other people. A healthy diet could change your life.